Let’s just call it unofficial smoothie week around here. 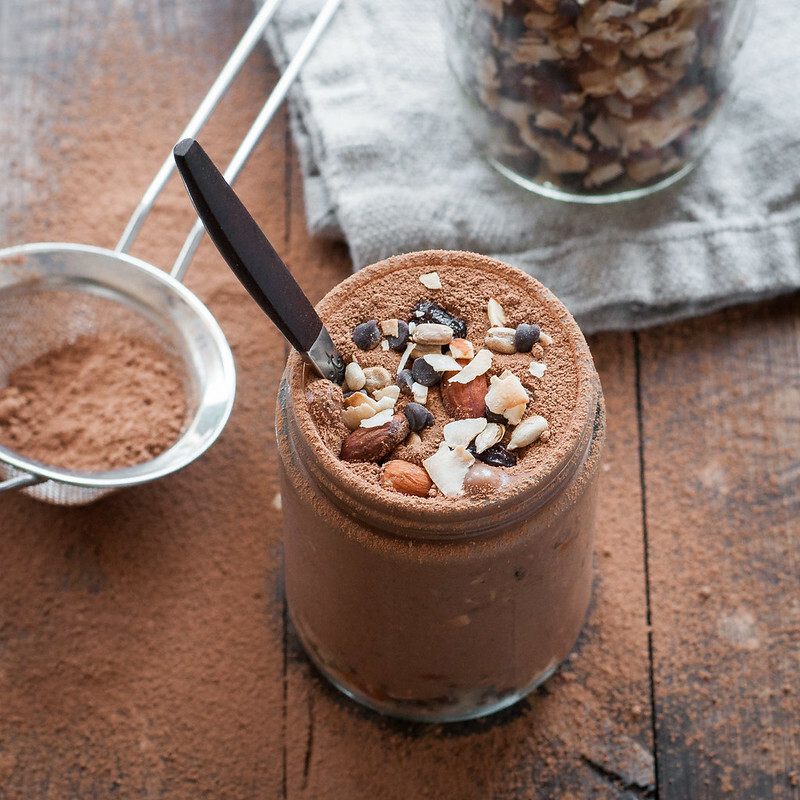 Surprisingly, I don’t really plan out my blog post recipes in advance, so it kind of just happened that my 3 ingredient green piña colada smoothie and this vegan trail mix chocolate breakfast smoothie hit in the same week. Perfect timing, though, because it’s 90 degrees plus in the swamp that we call Connecticut right now. Happy sipping! Can you put raisins in a Vitamix? I think if Rich Roll can put avocado pits into a blender and drink them, which I find just plain bizarre, raisins will be okay. Why would I want to do such a thing, though? Does anyone even like raisins? I, for one, am not the biggest fan of snacking on them. They coat your fingers in super sticky glaze and then have the nerve to go getting stuck in your teeth. WTF raisins? Standing at Trader Joe’s yesterday, though, the cashier inquired about my package of dates, and I proceeded to try to encapsulate my excitement about medjool dates as smoothie sweeteners and endurance workout snacks (because I do so many endurance workouts?) into one sentence. I don’t think he was convinced. I know super foods are taking over the world and even your Aunt Dorothy in Nebraska probably knows what flaxseed is, but my inquisitive cashier served as a grounding reminder that not everyone is comfortable starting their day with a date and spinach smoothie. Raisins, unlike dates, are easy to find. Unlike many other dried fruits, they’re are also usually unsweetened, because they’re plenty sweet! Just think about eating a purple grape. Sweet, right? I mean, that has to be why kids love them so much. So, without any added sugar and the fact that they’re kind of a mini date that you don’t have to pit, it occurred to me that raisins just might make a highly practical sweetener for a chocolate breakfast smoothie, without getting lodged in my molars. Not just raisins, though. No, we’re going whole hog (with the vegan smoothie, bad figure of speech) and tossing in plenty of frozen banana slices and handfuls of trail mix, superfoods and all. Coconut flakes, nuts, seeds, and “healthy” vegan chocolate chips. Or at least I’m going to tell myself they’re healthy. Plenty of healthy fats and protein to keep you full ’til lunch, or, if you have an appetite like me, at least until 10 AM. Instead of my usual plain old almond or plant milk, I used chocolate almond milk for the first time ever in this smoothie to really up the chocolate factor. I have to say, I was a little hesitant, but Almond Breeze was kind enough to send me some of their chocolate almond milk, so I was out of excuses. I used the unsweetened chocolate flavor chilled super cold as a base for the smoothie, and it definitely added the extra decadence I was looking for. 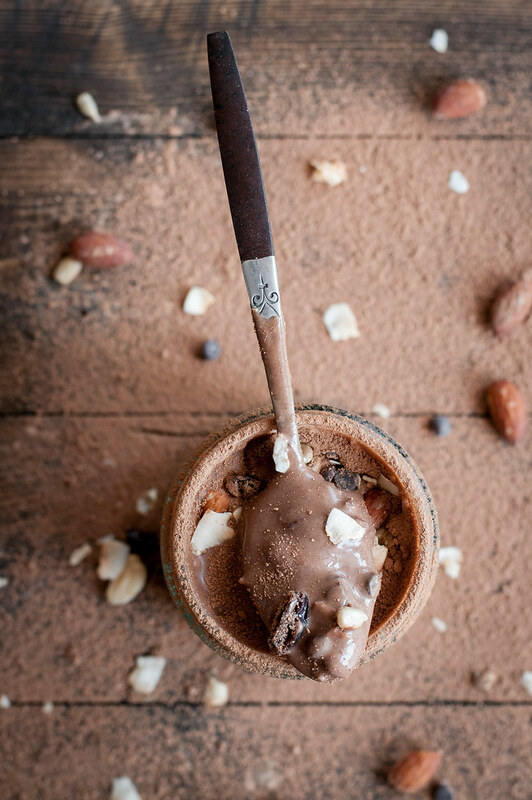 Not only is this chocolate smoothie simple and healthy enough to whip up for a quick, refreshing breakfast, it also happens to be satisfying enough for a sweet tooth or chocoholic any time of day. It’s up to you what kind of trail mix to use. To avoid all that added sugar and other junk, I like to make my own, but I know that kind of defeats the purpose of a 3 ingredient smoothie, so feel free to use a store bought mix. Just promise me you’ll read the ingredients, keep it vegan if you’re into that, and not pick the one that’s like 95% M&Ms and chocolate covered raisins. If you do make your own trail mix (applause! ), here are the proportions I prefer. My “part” is usually 1/2 cup. 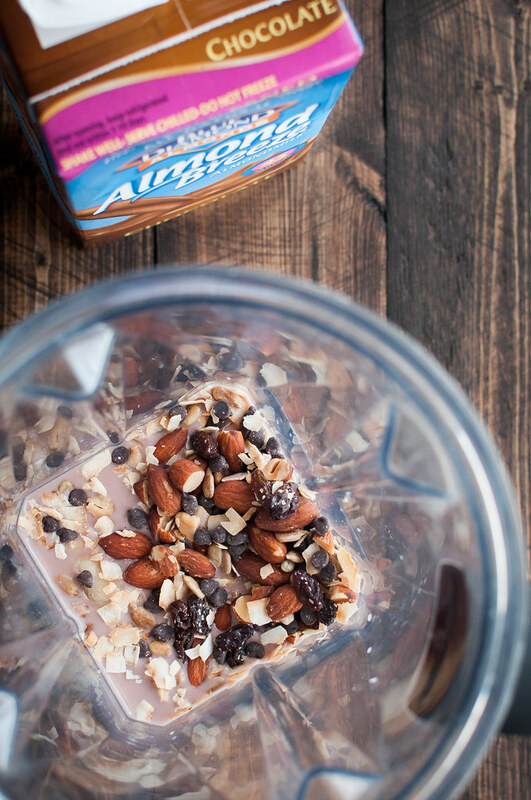 For a really satiating breakfast smoothie, layer extra trail mix with smoothie in the glass like I did. Nope, that’s not just for pictures! After the photo shoot, I mixed it all up and then had myself what seemed like a DQ Blizzard, only so much healthier. I fed one bite to Steve, my ice cream-obsessed dairy king, and he wouldn’t even carry on a conversation with me until I handed over the whole glass. Um, hi, I’m trying to talk to you stop eyeing my beverage. Final word of advice: serve your chocolate breakfast smoothie with a spoon, not a straw, especially when doing the trail mix stirred into it. No chocolate chip left behind. 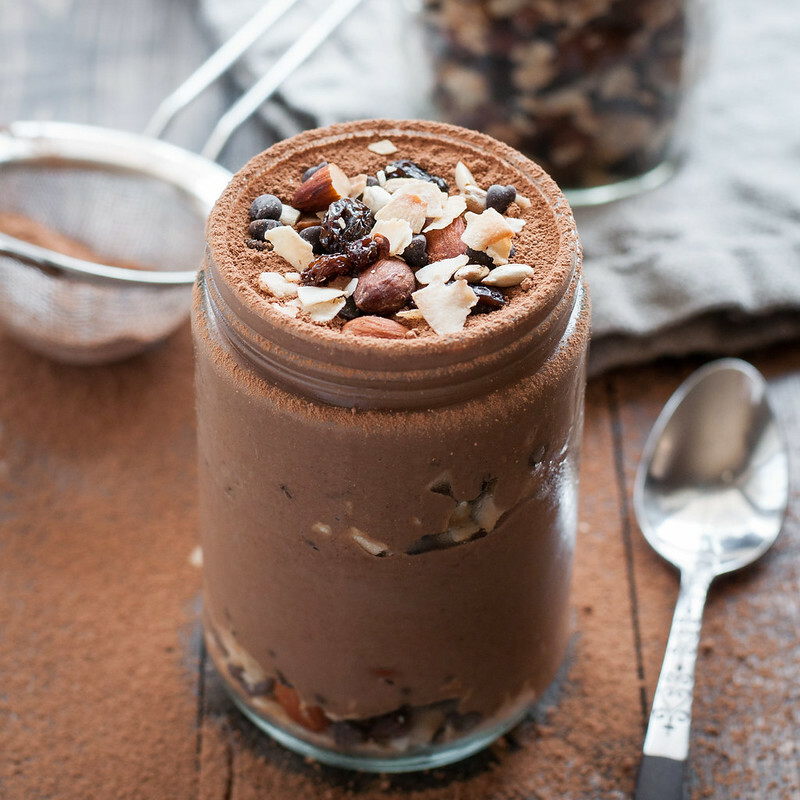 Pre-made trail mix makes this chilly chocolate concoction a 3 ingredient wonder! Perfect for breakfast or a treat, it packs protein, healthy fat, and no added sugar, and it just so happens to be 100% plant based--love when that happens! Add ingredients to blender in order listed and blend until smooth. If using a Vitamix, the smoothie setting does a good job increasing the speed slowly. Otherwise, if you have variable speeds on your blender, start slow and gradually work your way up. Serve icy cold for breakfast or a healthy snack. 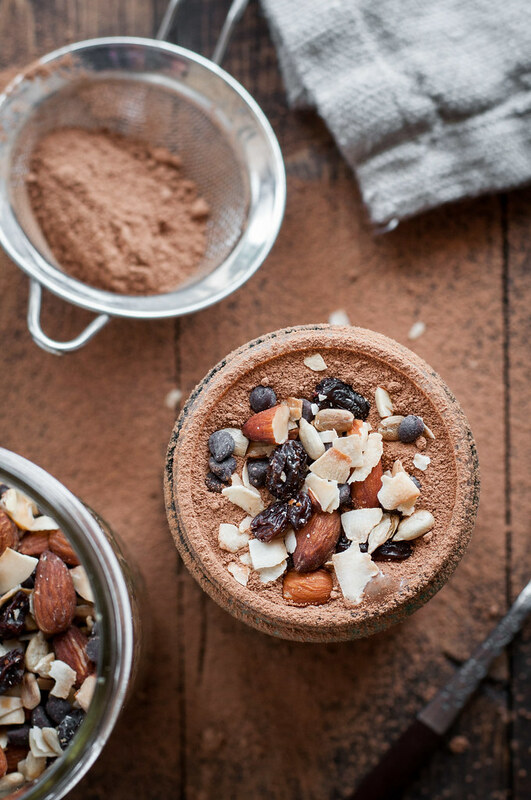 Garnish with more trail mix or cocoa powder for extra fun. See my green piña colada smoothie post for blender recommendations at all price points. This page contains affiliate links to products I recommend, on Amazon. 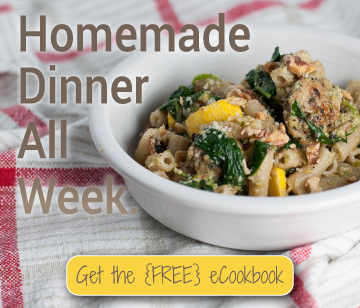 Affiliate income helps offset my ingredient and website maintenance costs, so I can keep bringing you easy breezey recipes like this one. Thanks and happy shopping! 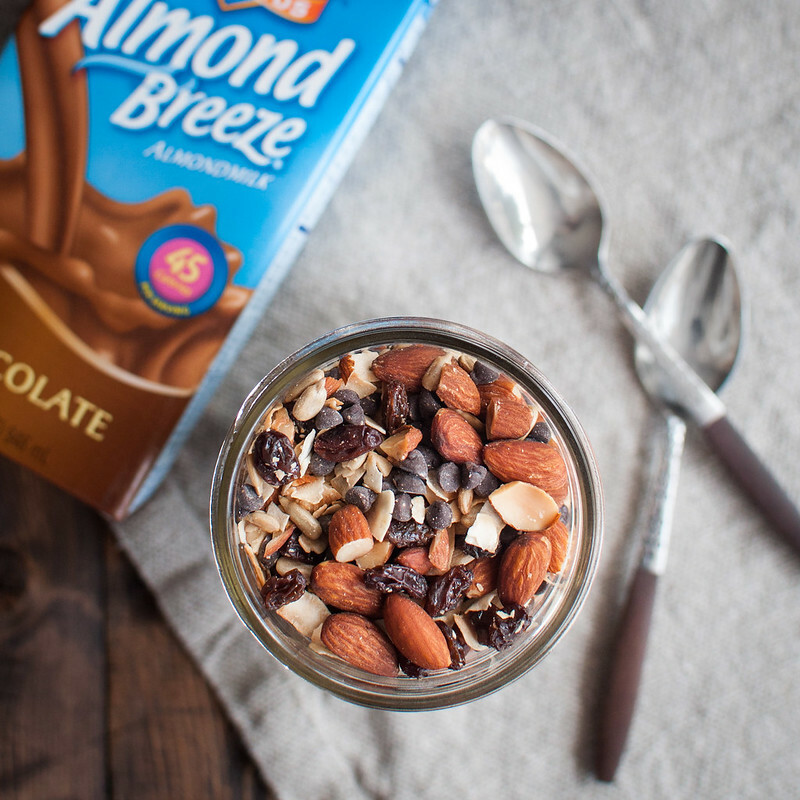 Almond breeze (especially the chocolate flavour) is a product I always have on hand – so this breakfast smoothie is too perfect for me to make. Love it. My partner and I love this Smoothie; we keep it in Vartan’s office. Wow, now that is inventive, and I know the Vitamix can handle those kind of ingredients. It is funny how you always see dates as a natural sweetener in recipes but never raisins! Definitely curious how this turned out. I’m a big fan of cocoa in my morning smoothies for sure.